Weddings are incomplete without good music, particularly in India. Like everything else, the Wedding Music also has to be the best. 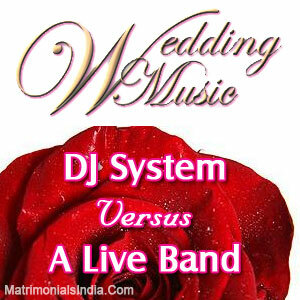 Different situations and ceremonies of a wedding need different music that can heighten up the enjoyment quotient for the guests and the couple. Thus, a sound arrangement for music becomes almost a necessity. Live Band : Off late, some people have started hiring a Live Band to perform at their wedding. The band generally comprises of a lead singer, guitarists, drummers and other members. Bands are instructed beforehand as to what kind of music would be required at function. Entertainment Value : Though both the music systems entertain the guests to the fullest yet each has its own pros and cons. If the DJ does not have a sufficient list of songs or is having a trouble in managing the huge song lists, chances are your guests might get bored. On the other hand, Bands can understand the mood of the crowd and can play the music accordingly. Audio Quality : This is one factor that most of the people tend to ignore while finalizing a music system for their wedding party but regret later. The DJ walas, as Disk Jockeys are popularly called in India, bring their own high quality speakers. However, in case of a band, you have to find out that whether they can arrange the microphones or speakers on their own. Money Factor : It depends on how well-known is the band or the DJ you want to hire. However, hiring a band is more costly in general. Though one can hire an amateur band to cut down the costs yet it can prove to be a wrong decision if the band does not know how to entertain the crowd. The ultimate aim of arranging a music system for the wedding is to entertain the guests and to add more fun to the wedding rituals. Thus, one should opt for the Wedding DJ or the Wedding Band that is well aware of the essentials of a Wedding Music.